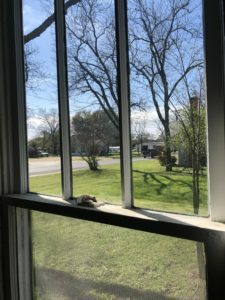 I wrote a post in my ranch blog about some things I found out about the Walkers Creek area during a visit to the Milam History Museum in Cameron. Read it, if you want to! What I was really there for, though was to get more information on the property we own and are using for our offices, the old First Christian Church, and the house behind it. Melanie Reed was gracious enough to introduce me to Charles King, who runs the museum and is a major collector in town. He brought out some fascinating photo albums of Cameron through the years, and even looked up the original owners of the Gillis house, the Pope family, in their archives to see if anything was there. We could not find any photos of the Gillis house, or maybe we should call it the Pope house, but we got some good information that I’ll be able to use in a future post. We found a great image of the church, though, a postcard that had been mailed in 1912, so we know the photo was from around then. It shows how beautiful the original building was, in pretty good detail, though perhaps the telephone pole right in front is not helpful. I wish those trees were still around! I was happy to learn that Charles has the negatives to these photos, so I will order one of those and get a nice print made to display in the chursh when it’s renovated. Well, it must have been easy for her to work at the church, given its distance from her home! Maybe it’s NOT a coincidence our two properties are tied together. By the way, I also found out that Mr. and Mrs. Fuller (James Pierce “Buddy” and Irene), the next owners of the home, also attended our church (Cameron Herald, 08 Oct 1981). Smart people. Cameron Herald, June 25, 1959. I did some more research on the First Christian Church of Cameron over the past few days. I got as much as I could from the newspapers.com collection of the Cameron Herald through 1985. The current building replaced a wood one in 1935, under the direction of Rev. Grove, who also doubled the church membership during the 5 years he led the congregation. Here’s the cool part: The whole thing cost $6,000! 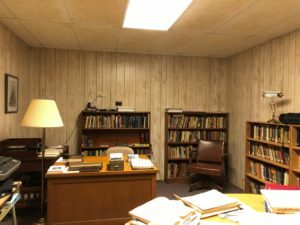 I learned that the church used a nearby house as Sunday School rooms for a time, starting in 1959. I wonder if it was the house next door? The article from the Herald on October 26, 1959 said it was on Gillis St., but the next-door Rossen house faced College Ave. Maybe someone will remember that. There was a house on Gillis next-door to the Rossen house, so that could have been it, too. I also learned that the carport where we park our cars was added in 1969. I wonder if the one that’s there is the original? I wonder so much about this building! 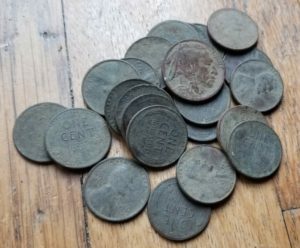 Old coins, including an Indian head nickel that David found for us. For a few months now, I’ve been delving into the history of the properties we’ve acquired or are in the process of acquiring in the old part of Cameron. There will be a series of posts on what I’ve found, as soon as I gather all my information. No foolin,’ I got a nice boost of knowledge when a local historian and reader of this blog, David Basonic, showed up at the office and talked to Mandi about what he’d learned after reading my post last week when I solved the mystery of why the Rosson family never lived in the Gillis house, but DID live on the corner of College and Gillis streets (which used to be 2nd St., and before that was Bridge St.). Oh, and by the way, Main Street used to be Belton. Just look at that window with no paint splotches on it! Look at how much space there is between you and your neighbor. We’ve had our Travis 2 house for rent for a while. It’s been frustrating that Mandi and Lee keep going out there to show the house to people who just don’t show up. So, they’ve changed the plan, and now you don’t get to go in the house if you haven’t filled out a rental application. At least that lowers the frustration levels. Unfortuately, it doesn’t stop the stream of callers who, after looking at the sign, call and ask what the rent is, then, after Mandi explains, they ask if we would take $300. Yes, in Cameron, the expected rent seems to be $300 a month. 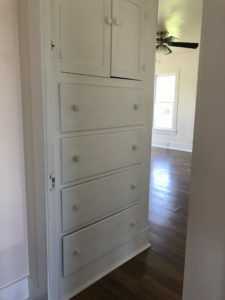 These cute built-ins lead to a HUGE master bedroom that no longer has three entrances. Before. It was a very crowded office. You may have noticed that we are getting busier and busier over at the Cameron office where we do the Hermits’ Rest Enterprises work. Lee has been working on some proposals for even more work, and has decided to bring in someone to help with some of the more technical areas of the project. 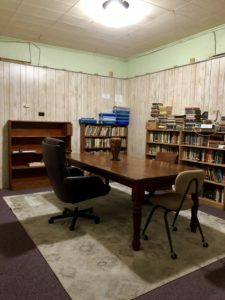 To do that, we need to have a space for our new colleague to work in while in Cameron, so yesterday, Mandi and I went nuts on the final part of the office to get cleaned up and ready for use: the former minister office. It was a lot of work and sorta gross, but we did it. After. Only the bookshelves and some of the books remain. What we did was turn that room into a new conference room, where our visiting consultant can easily work, as well. It already has Lee’s scrum board in it and some of our files, but it had yet to be cleaned of the debris from tearing out the ceiling, and had not been vacuumed. Our biggest obstacle is that there are still all those old ministerial books in the room. We did not have time to pack them up or anything (besides, all our boxes went to Aunty’s House), so we vacuumed them and put them all in one place. That cleaned up a shelving unit for us to use.